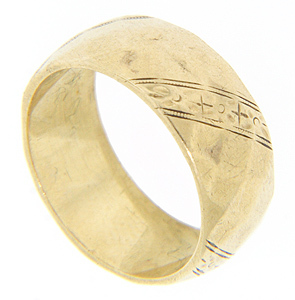 Diagonal floral designs serve as ornamentation on this 14K yellow gold vintage wedding band. The surface of the ring is faceted, allowing the ring to catch and reflect light from many angles. The wedding ring measures 8.1mm in width. Circa: 1930. Size: 7 1/4. Cannot be resized.